I’m not a fan of digging, so it’s no surprise that I’m a huge advocate of no-dig plots. I’ve wanted to increase my growing space quick and easily this year, and being well over the half-way mark in my pregnancy and with a slightly dodgy back to boot, a no-dig plot is the perfect solution. And luckily for me, someone who has very little patience and an ever-decreasing attention span, creating a new no-dig vegetable patch is quick and relatively fuss-free. My new plot was going straight onto lawn, so I mowed the lawn down first and quickly removed any perennial weeds. If you have time, you can lay down a layer of cardboard or pond liner to exclude light for at least six months. This weakens invasive perennial roots (think nettle and bindweed) and they eventually give up (or are really easy to pull out). As my patch was mostly grass and clover, I simply laid out some bamboo canes on my lawn as a general guide for where I wanted my new plot to go. Next up, I laid out a layer of quick thick cardboard. I initially had a few large pieces of cardboard to hand, but having completely underestimated how much I actually needed, managed to pick up some little bits for free from my local plant nursery and layer those to ensure all the grass was covered. Next, I emptied a load of well rotted organic manure onto the cardboard to weigh it down. 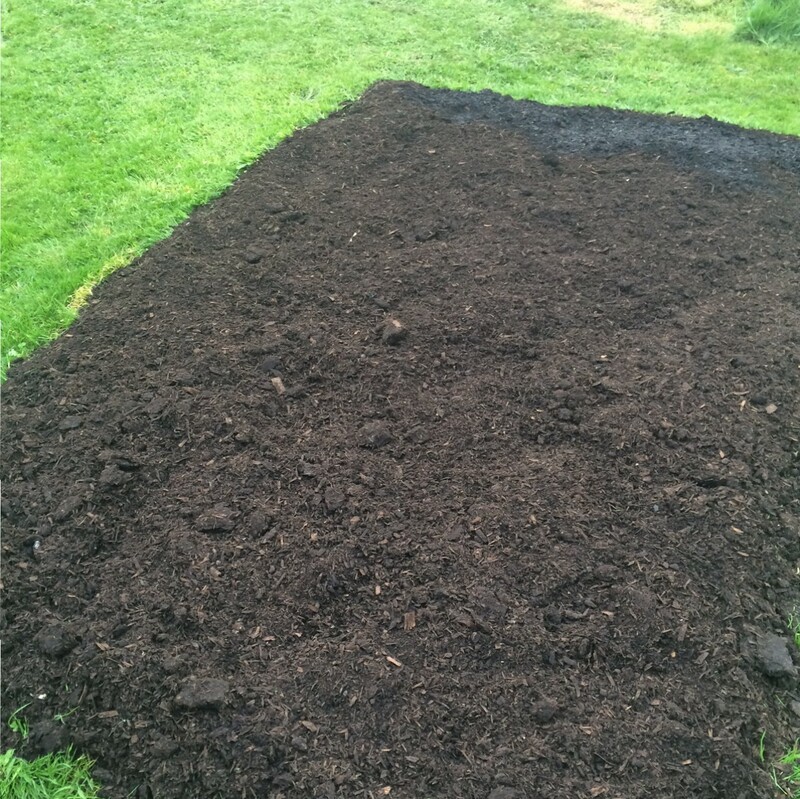 I used 8 x 50litre bags which, spread evenly, gave me about a 3-4″ depth. To be honest, I probably would have put another 200 litres of finer compost down on top if I could, to add some depth and a finer till. But if you can get your mulch/compost/manure delivered in bulk or make your own compost (we’re getting there), even better. I always go for organic… just because I don’t know what the hell could end up in other non-organic compost mixes! I then gave the compost/manure mulch a really good soak. It can be quite prone to drying out at the moment with these warm temperatures so I’ll keep an eye on it. The aim is for the cardboard to do its thing and break down to allow the worms and soil life to flourish underneath. For this year, I’m going to keep my planting on this new plot light – think salad leaves, radishes, beetroot… Just quick-growing crops that don’t require a huge amount of soil stability or need to root deep down. 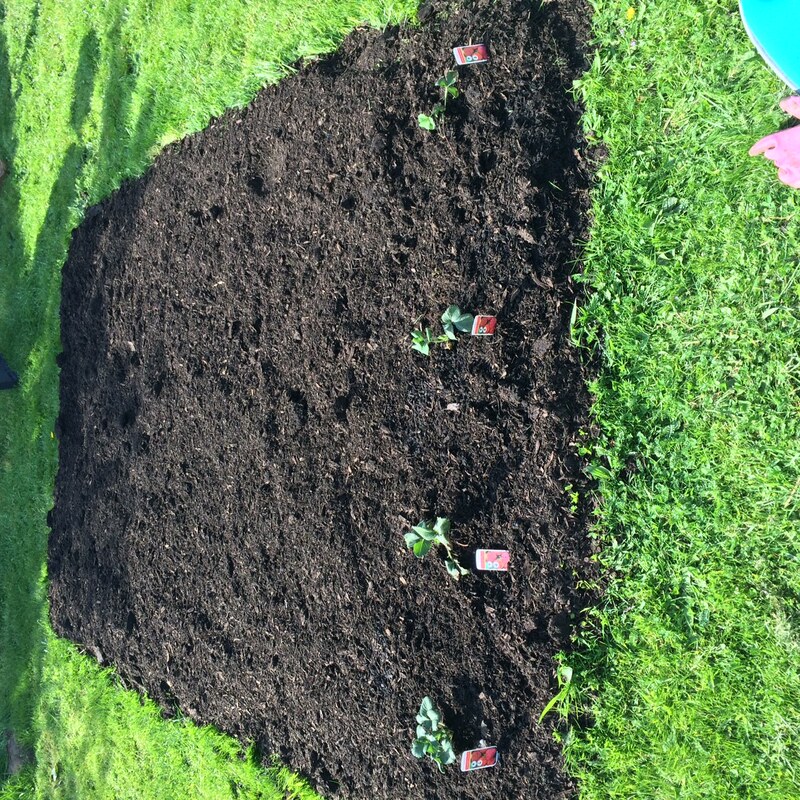 I also planted in four little ‘Cambridge Favourite’ strawberry plants too, just to see how they get on. I’ll try and keep the strawberry runners in check and it’ll be interesting to see if we manage to get a teeny tiny crop of fruit this year. Come autumn, I’ll mulch liberally again and will probably for this first hot growing season keep adding a bit of rich organic compost every few weeks to build up the soil. We’ve gone from 25C and pure, unadulterated sunshine to persistent rain (but still relatively warm) – which, if I’m honest, is great for the new plot. I’ll keep you posted on progress! I love no-dig – it works so well. You just need a good supply of cardboard! Yep, true! And of course this week we’ve had umpteen deliveries with masses of cardboard! Typical 🙂 I’m just so surprised more people don’t know about no-dig… it’s made such a difference for me.